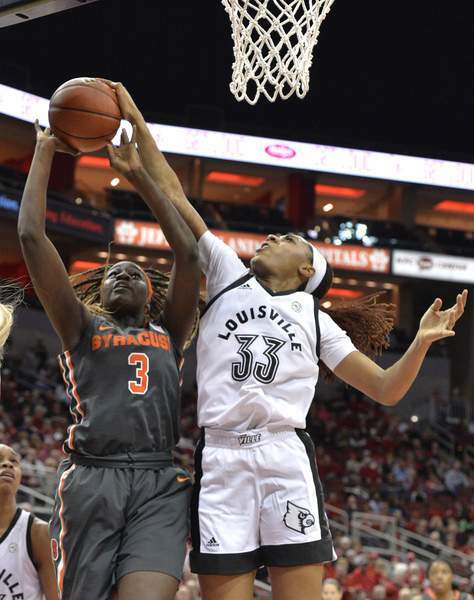 Associated Press Louisville forward Bionca Dunham (33) blocks the shot of Syracuse forward Maeva Djaldi-Tabdi (3) during the first half of an NCAA college basketball game in Louisville, Ky., Thursday. LOUISVILLE, Ky. – Asia Durr scored 15 points to help No. 2 Louisville beat 15th-ranked Syracuse 76-51 on Thursday night. Kylee Shook posted her third double-double of the season with 12 points and 11 rebounds for Louisville, and Dana Evans added 12 points in the victory. The Orange (17-5, 6-3), who lost for the third time in five games, scored the first eight points of the second half to make it 51-38, but they never drew closer the rest of the way in posting a season-low point total. Kiara Lewis led Syracuse with 13 points. Syracuse: Coming off its second bye week, the Orange looked a step behind Louisville early and couldn't recover. The loss keeps the Orange in sixth place in the toughest conference in the nation and on the outside from getting a valuable double-bye in the ACC Tournament, which begins in less than a month. Louisville: Even though it won't turn heads like the Cardinals performance over UConn last week, the Cardinals added another impressive victory for their NCAA Tournament resume by routing the Orange, who entered the night ranked No. 10 in the Rating Performance Index. It's the type of win that will bolster their argument for a No. 1 seed. Syracuse: The Orange return home to face Boston College on Sunday afternoon. Louisville: The Cardinals travel to Virginia Tech on Sunday and then will get a week off from action.